Dream Machine - "A Castle of a Thousand Universes"
Dream Machine is back after 3 years with a new CD. It took them a long time to make this one but it was worth it. 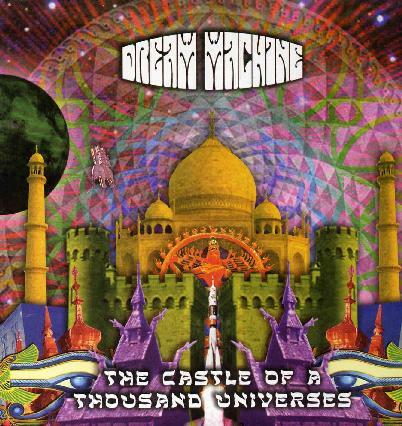 Dream Machine features now or in the past several ex-Ozric Tentacles members plus guitarist Alex Pym (who used to jam and play with a lot of the Ozrics guys in stuff like Pyramids in Space) and Italian bassist Gabriele Tosti (who writes a lot of the material - 3 of the 8 tracks here). Jumping Jon plays a lot of really great woodwinds on this CD and ex-Ozrics drummer Metro steps in as well. The CD features 8 tracks in about 50 minutes. The opening track is a short acoustic piece about one minute long before Vasta Wazza kicks in with the bass leading and some glissando guitar and space sounds before it takes off. Jon plays some really cool mid-eastern horns and some spacey synths layer in as the track goes off to India or somewhere. Great track. Dub Dub is a 4 1/2 minute dub track. Nice. Happy Dragon begins very happy with a flute solo and just drums and bass before Alex kicks in with the melodic guitar riff and later some ripping guitar. It gets quite psychedelic at the end of this one. Vanishing Point is over 8 mins and has some really great stuff by Jon and it really builds up in a nice way and I like the hand drums. A very nice laid back groovy piece. Sugar Glider is the first track to really feature some lead keyboards and has a nice organ part, and Alex rips out a solo in Ed Wynne style. A quite funky groove on this one. Mantra starts mysterious and spacey and again takes us to the eastern part of the world with its overall vibe. I like the acoustic guitars on this one. The title track ends the CD and this is actually my favourite track on the CD. I just like all the dynamics in the track. It is quite a bit like Ozric Tentacles but what can you expect. A very nice spacey psychedelic CD. Hope we don't have to wait 3 years for the next one!